I was leaving to Mexico City in two days, and I get this message at 4 pm Saturday, April 13. The Los Angeles Police Department officers stopped by the party and told the group to shut it down. But the police officers left, and didn’t return. When I arrived, the party was still going strong. Kids played in the jumper at the top of the alley, as adults talked talked amongst themselves at tables on the opposite end. I had only reported on the alleyway a few weeks back, but I never got to see the place actually come alive. Police have warned they would shut down this and other alleyway activities if they weren’t ended voluntarily. But despite the threats and harassment the LAPD have yet to close one, said Elizabeth Blaney, co-founder of Union de Vecinos. The residents didn’t ask for permission or receiver permits to paint the ground or have a party in the alleyway, but they try to be flexible when cars are around. They coordinate with vehicles to not enter the half-block stretch and they also coordinate with residents exiting driveways. “Having demonstration models, we want someone to tell us that this doesn’t work,” said Leonardo Vilchuis, co-founder of Union de Vecinos. 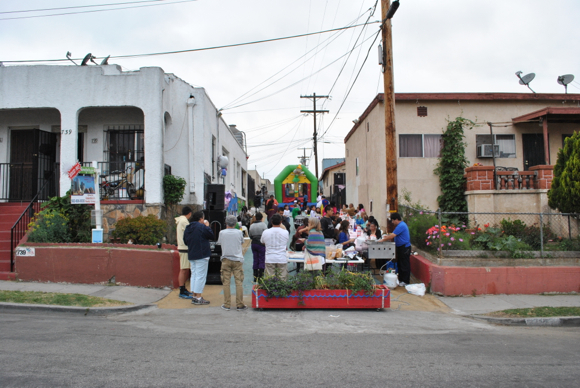 “We have an alley that can be used in so many different ways than just for cars,” Vilchuis said. So what impact does opening an alleyway for uses beyond moving cars? 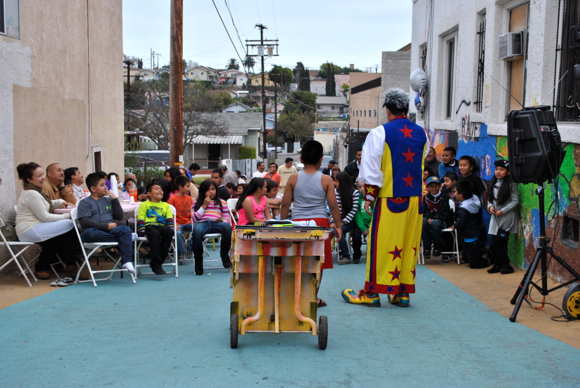 Look on after the jump to see L.A.’s Livable Alley. Someone needs to spend 1m on consultants before this can happen. Why is it people think they can do what they want and blame everyone else? They need to have permits plain and simple. Intelligent people don’t just do what they want and set up shop. No other area in Los Angeles is allowed to do this. Alleys are for a reason. There is no way as they say they help get cars thru. You can see the vendors selling food to make money so why don’t they just get the permit?? There are certain cultures in LA that think rules/ laws don’t apply to them… Or that they are simply a suggestion. Nice lessons for the kids: when an officer asks you to comply, simply ignore the request. Great parenting. There are zero parking spots being blocked by this, and it only blocks one end of a presumably two-ended alleyway. The event is a birthday so it’s very unlikely that’s a vendor selling stuff (not that it would matter much if it were). The question you should be asking is why they need a permit in the first place to get together as a community and have a non-intrusive event? If you actually think they should be required to spend hours getting a permit so that people who want to park in the alley can save an extra ten seconds you’ve got your priorities way out of whack. This is a win for community. How difficult is it to get a permit? If the vast majority of the community is in favor, then it ought to be really easy, but I don’t know if the city permitting process is extremely difficult. 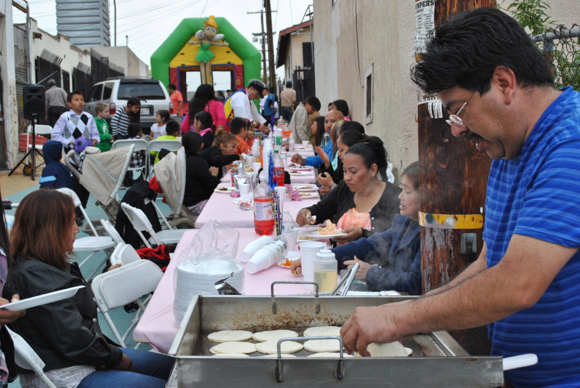 Alleys in Boyle Heights are entrance and exist to mainly drive way and garages, but most of all the fire department, paramedics and other emergency vehicles. 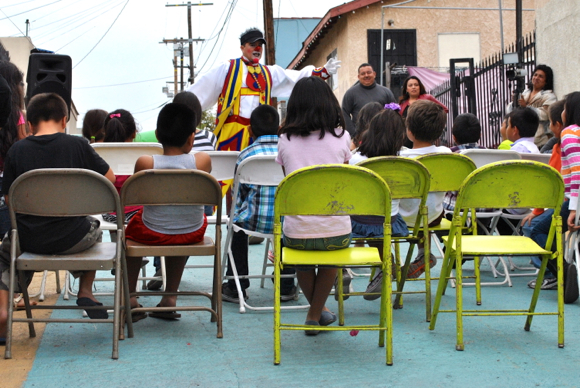 It does sounds like a great idea for parties, however, it should be a free entrance, Vecinos Unidos should educate people instead of just always ignoring the rules and regulations because one birthday party or whatever sounds good. Also, people would tend to go along to keep neighbors relations in a good standing, however, or afraid of retaliation from neighbors. Vecinos Unidos have demonstrated in community meetings that they have no respect for the rights of others, they disrupt meeting when the rest of the community want to participate too, yet they take over the microphones and the stage away from the rest of the attendees, and sometimes I feel this is done on purpose to keep the community from participating in important discussions like the MTA meetings on t he vacant properties. Rules and laws are made to protects us from each other too, and abusive paid demonstrators to interfere the voice of the community. The community lost on the MTA lots, because we were not able to discuss the issues at the meeting. forget that the people voted for those laws and rules only to protect us. If they feel rules or laws are not protecting the people, than have it amended or change, This non profit are overstepping our rights, and they are using our tax payers money to destroy communities. Somehow this non-profits only protect politicians to get away with things, and the non profit have money to organize against the community itself and support politicians that are not working for the best of their community. If this non profit would really protect the people, their funding would be cut from politicians that don’t agree with their own community. Millions of dollars are going to non-profits, and are paid so support against communities itself. “Need to have permits” is one of the most insidious things for modern city life in America. “Need to have permits” is how you squash competition from food trucks and unlicensed cab services. “Need to have permits” is how you squelch any meaningful demonstration of 1st Amendment rights. “Need to have permits” is how you arbitrarily empower or disempower communities. Any time you see some informal aspect of street life in Europe or Asia and wonder why we don’t have it in America, there’s a good chance there’s a “need to have permits” behind it. I’m not so naive as to say you should never have to get a permit to block a city street. If you want to set up a bocce court in the middle of Venice Blvd at 8am, you should probably be told no. But it would be nice if authorities would occasionally just look the other way when there is no threat to public safety, as is the case here, rather than viewing spontaneous community organization with suspicion. 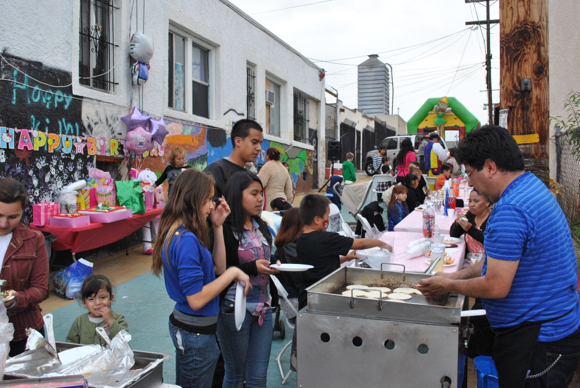 The idea that having a birthday party in an alley is destroying communities is one of the most ridiculous things I have EVER read. They should be fined for having vandalized public property. This argument “it looks nicer now” is as outrageous and preposterous as those who think graffiti and tags make a city have a “better” look. There is a process to use PUBLIC ROW’s for private events. It includes applications and permits. They should abide to the law. It IS intrusive for neighbors who live by the alley and might need to enter or exit their garages during these events. Now imagine someone is coming back and wants to park his/her car in his house, but the street is blocked. It is proving a NUISANCE for those who live by the alley and don’t like the idea or need to come in or out. Exactly. Tomorrow they will be teens thinking it is okay to ignore criminal laws and burglarize homes and cars, or even rob at gunpoint some business. They will grow as if morals and laws didn’t apply to them. Ghetto mentality fostered from early age. It’s similar to the basketball hoops or soccer goals you find in suburban streets all the time. I doubt LAPD is proactively finding these places; they are going because of a call for service. At least the pickup ball games can be easily moved out of the way, but putting chairs down is an issue. These are PUBLIC streets and there is a process for closing them, which was done in the Mid City area. If someone wants to travel through them they have a legal right to. It’s a big liability concern. Unfortunately almost every policy derives somewhat from risk management. That is why they require insurance and waivers. And a Nevada style tort limit will never be passed by our legislature. The real issue here is how pathetically public space poor our city is compared to the rest of the world. It is not the one birthday party in an alley that destroys communities, is the culture of not abiding by laws for safety of all the people. Remember laws made to protect and to keep safety for all. The LAPD were sensitive to the issue, and just gave a warning, however that warning should be respected, no one want to stop a brithday party, but you do not have a birthday party where ever, have it at park, in your yard, keep everyone safe. andrelot, yes you are right, and some neighbors would not go against it because of retaliation from neighbors. Apparently someone did not agree with having the party in the alley, and reported to the police, the police do not come unless they are called. I’m with you Shane. Liability and fire access and flaunting of rules and laws. Are these people arguing a bike lane somewhere? Very true…we have constructed a very broad legal definition of “negligence” in the US compared to other countries. It’s blocked from one side, and no garages are blocked. This is a non-issue. Slippery slope arguments are always so effective, especially when they’re motivated by racism. 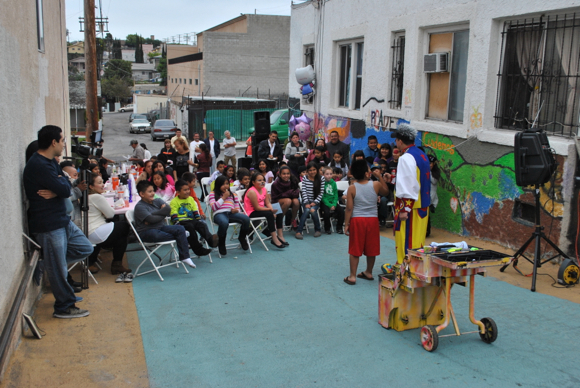 Blocking one end of an alleyway for a community birthday celebration does not lead to nor equate to a lack of morality or a criminal future. By the way, if you don’t want people to think you’re racist I’d avoid phrases like “ghetto mentality.” Disgusting. Eyes on the Street: Another Green Alley to Open Soon in South L.A.
CHP Officer Perez Reponds to Criticism from Last Week’s Column. Still Hands Out Misinformation.